The CMA CGM Theodore Roosevelt transits the Panama Canal's new Cocoli Locks. Two Great Pyramids of Giza, four Big Bens, eight Statues of Liberty. Lay them end to end, and you've got the equivalent length of the CMA CGM Theodore Roosevelt, the largest capacity vessel to ever transit the Panama Canal's expanded locks. At 1,228 feet long, the Neopanamax containership has a total capacity of 14,414 TEUs. The CMA CGM Theodore Roosevelt is part of a series of six CMA CGM ships bearing the name of the U.S. presidents. It began its voyage in Shanghai and called on ports along the U.S. East Coast, including Norfolk, Savannah, and Charleston, which have seen strong growth and record-breaking tonnage following investments made to accommodate the larger vessels now able to transit the expanded canal. The ship made its final stop on Sept. 7, 2017, at the Port of New York/New Jersey for the inauguration of the Bayonne Bridge, which was raised to handle the larger ships. 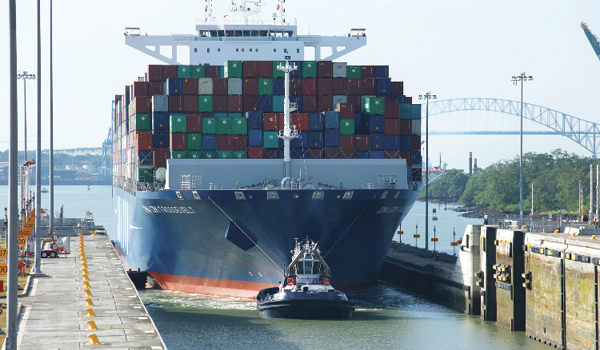 The CMA CGM Theodore Roosevelt is deployed on the new OCEAN Alliance's weekly South Atlantic Express (SAX) service, which connects Asia and U.S. East Coast ports via the Panama Canal. The SAX service is composed of 11 vessels ranging in size from 11,000 to 14,000 TEUs, including vessels that also transited the expanded canal earlier in May 2017, becoming the largest capacity ships to do so at the time. Looking to 2018, the Panama Canal Authority projects it will accommodate approximately 13,000 vessels—including 2,335 Neopanamax vessels—for a record tonnage of 429.4 million Panama Canal tons.